As people in Istanbul’s Taksim Square rejoice at having pushed back riot police who only hours before tried brutally to contain them, everyone is wondering where the real split is between Turkey’s government and its citizens. Mark Almond, a visiting professor in International Relations at Bilkent University in Ankara, reveals to RT an unceremonious government that underestimated the diversity of its people, as well as its own politicians, and how the country’s economics and issues of foreign policy have set up the atmosphere for one the biggest short-lasting revolutionary events in Turkish history. RT: Who do you blame for the violence - the protesters or the police? Mark Almond: Well, I think there has been massive police action, and of course it has backfired. And this is a very dramatic moment for Prime Minister Erdogan, who’s had for the first time to step back. He was extremely aggressive in his initial statements that he wouldn’t tolerate protest. And now the man who was the first world leader to call for [Egyptian] President Mubarak to resign is talking rather eerily like Mubarak did shortly before his own fall. He is now saying he’s going to investigate the police, he’s concerned for the people. He wants to carry on the project, so he’s managing to, in a sense, muddy the water. But I don’t think it will calm the situation, because if he insists on carrying on with the project, which is very unpopular - and symbolic of what many people see as kind of a high-handed approach where property developers and government together simply push aside local opinion – he still is going to keep the protest going. But at the same time he’s shown weakness, and this is the first time he’s shown weakness. RT: Has the political opposition got any hand in this? And he’s also got the problem inside his own party. The president’s public statements are much more emollient. And there’s believed to be a tension between the president, Gül, who doesn’t want to stop being a president, and Erdogan, who hopes to change the constitution so he will become president. RT: What should the government do to protect other members of the public as the protest continues? MA: Part of the problem is that the excessive, massive use of teargas has disrupted ordinary life for many people in this very densely-populated part of the city. It has also disrupted tourism: this is a city that has huge numbers of foreign tourists – many of them have been affected, many of them sought medical help. It’s a public relations disaster with huge economic implications. And the Turkish economy, which had been doing very well for the first 10 years of Erdogan, is beginning to stall. The property boom is turning into a bubble that’s bursting. The war in Syria is worrying people with violence on the border. But also, if you then begin to have measures that are fighting off tourists, including, of course, his measures about alcohol, his moral reform measures, you begin to have a whole dangerous mélange of issues all bubbling up together. And I’m not sure that the government really has thought through what is its main priority, who are the people that it really needs to keep on board, does it really need to offend all these different groups, does, actually, the center of Istanbul, not need at least one bit of green space. 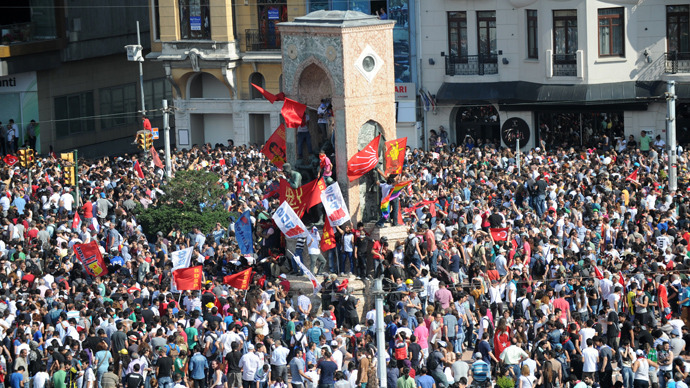 It’s a huge city with a very little space, and, of course, people say ‘How can we have democracy, if there’s nowhere where you can demonstrate, if everywhere is filled in only narrow streets?’ I’m afraid, like it or not, you need Trafalgar Square, you need Taksim Square.